The free Bud Lights weren't the only thing being snatched up in a flurry right after the Cleveland Browns won their first game in more than 634 days. 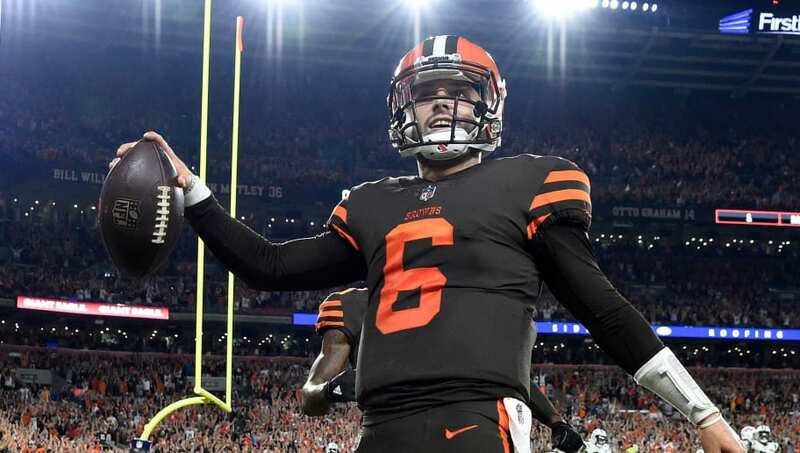 The savior rookie quarterback Baker Mayfield's Color Rush jersey sold out in less than 60 minutes after Cleveland erupted with a win over the New York Jets on Thursday Night Football. The Browns' No. 1 overall pick from the 2018 NFL Draft made quite the splash in his professional debut both on and off the field. After coming into the game late in the second quarter when Tyrod Taylor left with an apparent concussion, Mayfield finished 17-for-23 for 201 yards through the air with no interceptions and no touchdowns and a 100.1 QBR in just over 31 minutes of action. Interestingly enough, three of those six incompletions came on drops from his receivers, so he could have looked even better than the numbers already suggest.